Humorous, gestural, narrative, stormy, crowded, camouflaged, and fluid. Work first, reflect later, and read more. Starting is what’s paralyzing. I thought ideas preceded art, but it’s an ebb and flow. Sometimes it all comes together in the middle of an unrelated conversation. Stay curious and write about your work often. Apply to everything that is free to apply to. It gives you a deadline to work towards, and afterwards you have an artist statement, a portfolio, a resume, all ready to send to the next art call that’s posted. Try (although it can be hard) to see opportunities, not challenges. I’m still learning these lessons. Poetry, scientific phenomena, music, literature, gay stuff. In my conceptual practice I like to reflect on the intersection of personal narratives and cultural relationships to mythology, science, and psychology. In my recent paintings, I position myself within abstracted landscapes that are a little odd, a little funny. I work for philly Artblog, (theartblog.org) so I’m constantly reading reviews of local artists. Lately, since I’ve been painting, I’ve learned from Stephen W. Evans and Mark Thomas Gibson, local artists that I discovered while reading/ working for Artblog. My friend Gillian Mead (https://gillianmeadart.com/) taught me most of what I know about painting. I have my list of superstars tucked away, but I care the most about artists living and working in Philly. I collaborate all of the time! More so on projects than pieces. It’s important for me to be surrounded by like-minded, energized people. Philly is the perfect environment for collaboration. But hypothetically, probably Hito Steyerl. I heard her speak earlier this year at Moore. CT Jasper, my generous and huge-hearted former professor, constantly references her work in his classes. To not worry about making work that is original; it’s nearly impossible. It was liberating to realize that I was allowed to reference, and it ended up grounding my work in the tangible. I started doing research and making commentary. My peers became more receptive to my work, and I became more passionate about it. Post- graduation: becoming organized and integrating studio time into your schedule. Right out of school, you have all of this theoretical and conceptual training under your belt, but no more deadlines. It feels like every piece you start is the first piece of your career; it feels impossible to finish anything. I’ve been painting during this residency, which is abnormal for me. I studied Sculpture. But it’s gotten me back into the schedule of working regularly! I have momentum! I was working in a tiny room in my apartment that’s basically my closet. I would come home from work and stare at my paints, then at my electronic marimba (which is an amazing piece of technology) and then my laptop…. each felt like a career path. Should I be painting? Should I be recording music? Should I be writing poetry? Editing video? Meanwhile, I’m sitting on my bed just exhausted, knowing I needed to do laundry, eat, grocery shop. I needed a space that was just for art. Where I could go and be surrounded by nothing but materials and space. Jasper Studios gave me that. So thank you! Everyone should apply to this residency! Simplified colorful worlds that celebrate visual experience. Don't worry about the end result. Just keep making what you love and stay focused. The neighborhood. I run and bike around a lot. Certain times of day and certain landmarks on my runs inspire me. Kerry James Marshall, the French illustrator Blex Bolex, Henri Matisse, Pierre Bonnard, Suzanne Bocanegra-- I saw her show at Fabric Workshop recently. ﻿Who would be a dream artist to collaborate with? Maybe Swoon since she has made work in and about Philadelphia. Her work has a lot to do with people, and although I don't incorporate portraits into my work, I think about people a lot. Houses can stand in for people, a metaphor for the body and the head, not to mention their specific appearance reflecting on their inhabitants choices and lifestyles. Trusting my instincts and not relying too heavily on other people's opinions. Feedback is important, but ultimately my work is my own. ﻿Why did you apply to become a resident at Jasper Studios? And what did you hope to achieve during the residency program? I applied because I like looking at things in the neighborhood. Being at Jasper Studios gives me the opportunity to get to know a new part of Kensington. It gives me room to think and a fresh frame of reference for the work I'm making. I hope to make several large scale collages about the buildings in the neighborhood and striking visual moments I discover during my time at Jasper. It’s hard to say because I still feel like I am in the beginning of my career. I think I would tell myself to research and find more contemporary artists that can inspire and challenge me. Also to have confidence in the work that I am making and not to rely on others for affirmation. Kali Uchis, SZA, Princess Nokia and Tierra Whack have been on repeat for the past few weeks. All of these artists inspire me for many reasons. It’s exciting to see so many women in music really doing their thing, and it’s especially inspiring to get to hear another artistic voice from Philly (Tierra Whack). These musicians deal with some of the same things in their music that I deal with in my work, so listening to them can be a way for me to tap into some of the themes in my work but also motivation in the studio. Growing up and living in Philadelphia and coming from a Puerto Rican household has influenced my process and material choices in my work. If you look around Philly you’ll notice that so much of the environment is physically layered and responding to the architecture or objects that were previously there. I see my process of collage as a way of layering material and visual information to create a conceptual space relating to ideas of queerness and place. I also look to other artists whose work is similar to mine and spend a lot of time researching. Going out to shows and First Friday exhibitions always gets me inspired and motivated. Mickalene Thomas and Kerry James Marshall are forever my top. But right now I am looking at Kenny Rivero, Jonathan Lyndon Chase, Pat Phillips, Troy Michie, and Cheyenne Julien. I would be overwhelmed with excitement to meet or work with any of the artists I listed above. The dream would be to have a show with any of them. To keep making work despite everything. As an artist there are so many moments where you feel stuck because you are overwhelmed by possibility or where you really don't know what the next thing is. If you just keep making work, things piece themselves together, and you will get to an open door. Be patient with yourself because you are not a machine. Also I think it is important to write about your work and to stick with a community of people or artists who you can talk to about your work. I applied to become a resident at Jasper Studios because I had just graduated undergrad and needed a space to keep making work. 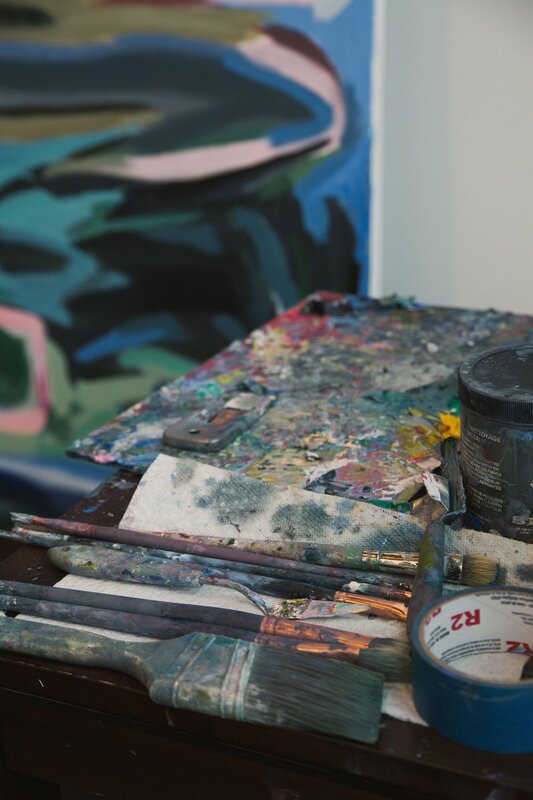 Jasper Studios has given me a space where I can work large and pursue the same concepts and processes which I was working on towards the end of my undergraduate education. While at Jasper my goal was to make a body of work that really pushed the tactile/sculptural quality of my paintings, while still exploring themes of queerness, gender, landscape, and material culture in America and Puerto Rico. We are excited to welcome our newest artists in residence to the Jasper Studios Artist Residency Program, Joseph Lozano and Chloe Pinero! 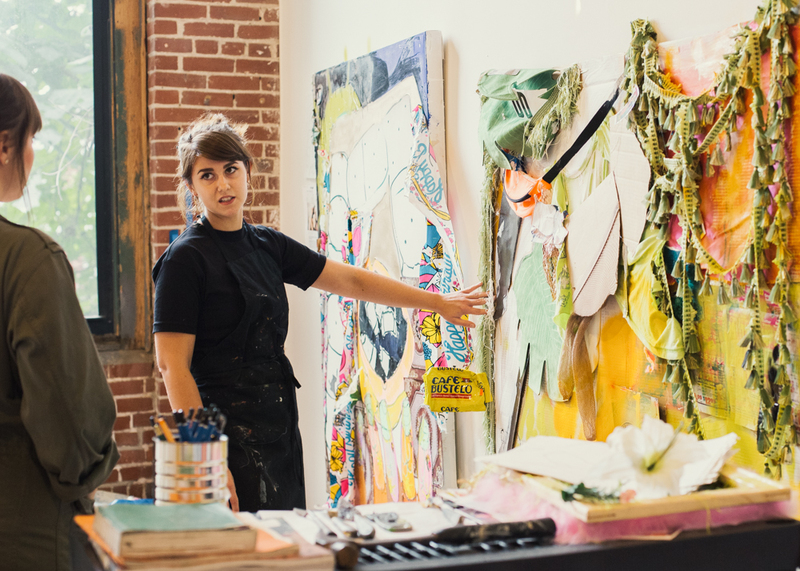 Every three months, artists in Philadelphia are welcomed to apply to the artist residency program. Artists that are chosen will receive a work studio space among an existing community of over 50 artists and entrepreneurs. 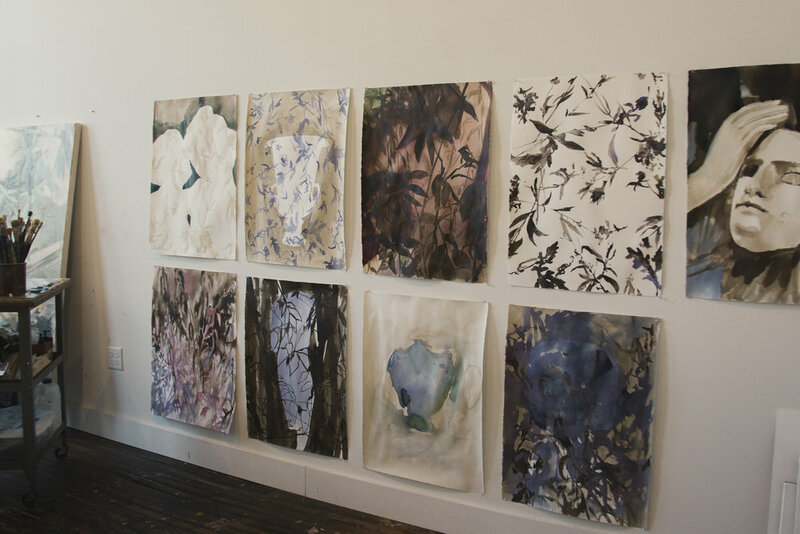 Patricia Thomas joined the second installment of our artist residency program this spring. Patricia’s work “explores the imagery of blackface” through beautifully vibrant and biographical paintings. 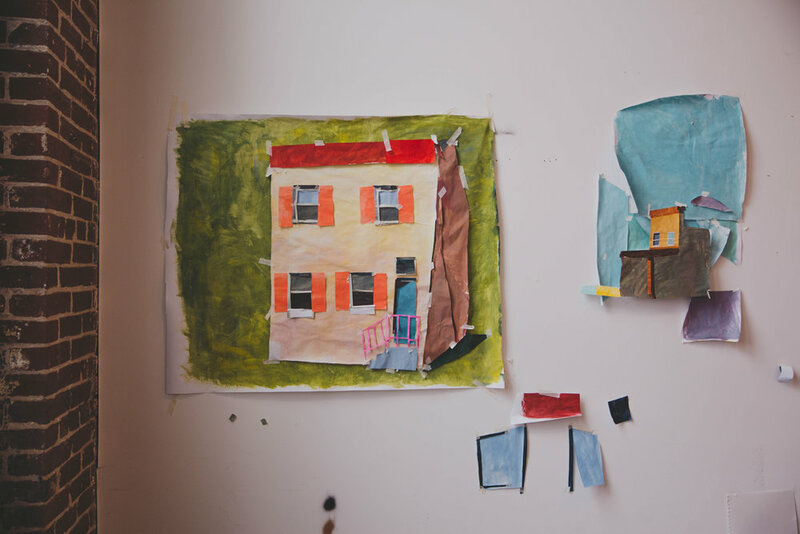 In our interview with Patricia, she discusses her focus on the community members that Jasper Studios neighbors, who would inspire the body of work she has produced during her time with us. 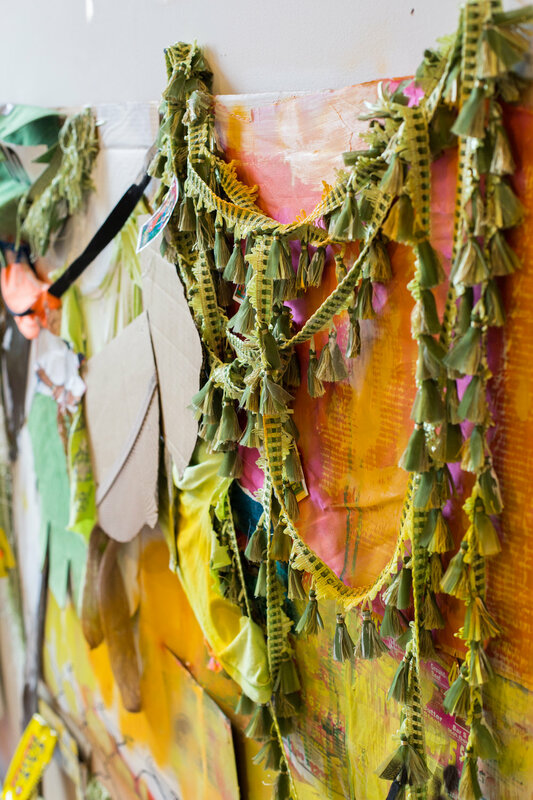 ​​​​​​​This spring we welcomed Patricia Swanson to our Artist in Residency program. Patricia is a photographer whose work goes beyond simple displays of imagery by creating an immersive, often mixed media experience. As her residency winds down, we are excited to share what inspires her and what she has been working on during her time with us.